Eltronicschool. - One the audio amplifier IC that will help you to create car audio amplifier with power 50 - 65 watts is TDA1562Q IC. With this IC the audio power output that can produce are 50W-65W. In this time, based on TDA1562Q as audio amplifier IC, we will give you one of electronic circuit schematic ofCar Audio Amplifier 50W - 65W Based on TDA1562Q like in Figure 1. below. Circuit schematic like in Figure 1 above is Car Audio Amplifier 50W - 65W Based on TDA1562Q. 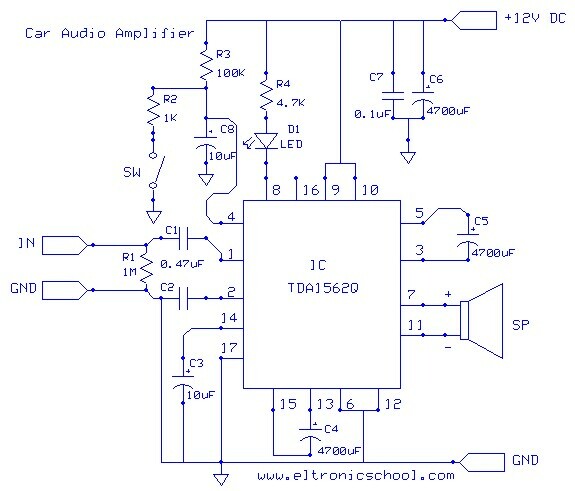 This a car audio amplifier circuit that has high power over than 50w Using the IC TDA1562Q Philips. Which It uses just 12 volts power supply only. But provide higher watt power to 54 Wrms at load speaker 4 ohms and there are distortion at 1% and watt power maximum 65 Wrms at distortion 10%. According Eleccircuit site describe how the circuit work as follow that the 50W BCL car audio amplifiers circuit, at pin 9 and pin 10 of IC1 into the power supply from the battery 12 volts. Then pin 6, 12 and 17 are connected to a negative voltage, there are two capacitors C6, C7 serves as eliminate interference and power backup for IC1, respectively. To make It run without distortion of the noise signal. Is to be noted that terminal of speaker will be connected to ground of system. Since we know already that the circuit is connected like the bridge amplifiers. So If there are connecting a speaker cable wrong point or connected to ground. The detection system will immediately errors. Resulting voltage pin 8 is close to the negative voltage, cause current flow through from voltage +12 volts, through to R4 cause LED1 glow to alarm user know error. If the operation of the circuit is normal, voltage at pin 8 is very close to the power supply, cause the reverse bias so makes LED1 go out. (A resistor R4 that series with LED1 can be damaged if too little.But if a R2 value too much. The current through LED1 less do not see the brightness of LED1. The lift level voltage circuit is connected output to pin 3, 5 and pin 13, 15. To will connected to the electrolytic capacitors C5, C4, to serves as boost current and voltage rises. makes power watts higher as well. At pin 4 of IC1 consists of switch S1, R2, R3 and C8 serves as select mode that will be Stand-by or Mute. Suppose that turn on switch S1 state now will be prepared so that wait a simple voice, Is turn on ready to work. But must delay before. Which takes about 1 second, wait the capacitor C8 charges through R3 before. The time delay is the symbol “T”. Can be calculated as follows. When R3 and C8 is equal to 100 Kohms 10 micro farads. The time delay is equal to 1 second. But if turn off switch S1 now C8-capacitor will discharge through R4 to ground This condition will stop the sound. While in a state of IC1 stop this noise. The very low flow is 200 micro Amperes. A stereo problem may arise due to negligence in its conservation and or improper handling, which can be solved with proper guided measures.